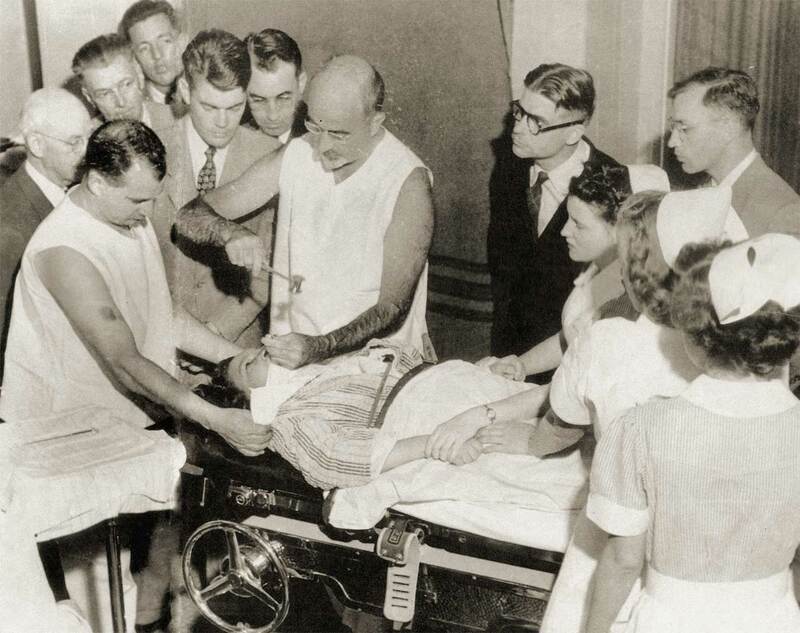 Teenage Lobotomy: acclaimed neurologist Dr. Walter Freeman performs a little mental health adjustment, early 1950s-style. When I was nine years old I could control the weather. My parents had bought their first ever “new” house, a tract home in a fairly new subdivision. This was a big purchase for them; upward mobility as exemplified by a life-changing purchase. While both were frugal with money, a trait their youngest son would not inherit, after 16 years of marriage, raising two sons, and much hard work, they were finally able to buy a new home. They had both grown up poor, my mom a child of the brutal climes of Eastern Kentucky; my dad a product of a colorful Irish American ghetto in Louisville. They were born out of a kind of poverty that seems to be retained at the genetic level, generations of lacking that is encoded in the marrow. I have never actually sat down and eaten in a restaurant with my family. “It’s a waste of money,” is my dad’s lifelong rationale. The home was a two story house with four bedrooms, a fireplace, and a large backyard. It was there that I would secretly display my occult powers of meteorological prowess. At that time I was obsessed with the idea of magic. Not stage illusion but the real deal; wizardry, sorcery, necromancy – the works. Much of this interest was surely spawned by the innate imagination of childhood. Once I discovered standard fantasy stories like fairy tales, “The Hobbit,” and “Conan the Barbarian,” that initial spark of dreams was soon engulfed by the fires of a specific form of self-hypnosis that surely falls away from all children over time. The problem was that my magical gift was a secret. As soon as I was certain that no one would possibly see me, I would sneak out into the fenced backyard. Our dog would invariably try to follow me out there but I would issue her a stern look and quietly close the sliding glass door behind me. My parents had opted not to purchase any grass sod for the back of the house. “Who will ever see it but us?” was both a question and statement of finality posed by my dad. So on that sandy, weed covered lot is where I would throw my arms in the air, directing invisible forces that in turn pushed the wind, rain, and even calm sunlight to do my bidding. I could feel the electrical crackle of my spirit touching the unknown, a current that would make my young body come alive with invisible and impossible energies. I had yet to hit double digits in age and I was already addicted to my first drug of choice: my mind. But some distraction would invariably break the spell and I would run off into other imagined possibilities. I did well in school and reluctantly played sports like Boys Club basketball. While in his teens, my dad had been a heroic-sports-figure in his hometown. The ultimate plan was for me to someday go to the University of Kentucky and play basketball. Then I would become a doctor or lawyer; anything to help raise our family further from impoverished roots. Yet my original dream was to become a special effects and makeup artist. My bedroom wall was covered with centerfolds from magazines like Fangoria and Famous Monsters of Hollywood. I was obsessed with the cinematic trickery of people being transformed into monsters or succumbing to spontaneous explosion of body parts. I was also a crazed illustrator of these types of things, to the point where my parents were contacted by a concerned teacher to make sure everything was alright in the family home; or at least in my head. My dad eventually resigned himself to the fact that both of his sons were about as athletic as a boulder and accepted that we were closer to loose screws than tight ends. I made good grades and was placed in the gifted program when I was eight or nine. I enjoyed these classes. I was introduced to the game of chess and the music of Bob Marley by one particularly vibrant and loving teacher and over the years I have forgiven her for both. 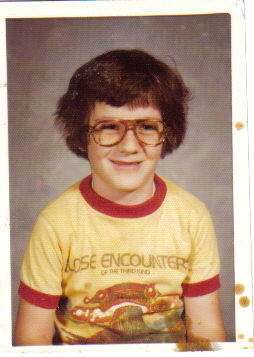 Barring my belief that I was some kind of secret sorcerer, I had a normal if not peaceful childhood. When I entered junior high school my previous assets and loves – academic smarts, a love of reading and drawing, and an open sense of camaraderie and inclusion – had somehow mutated during the summer break into shortcomings that set me a part from even kids whom the previous year had been, if not friends, at least civil allies. I fell headfirst into my ultimate solace; reading. I can recall being twelve-years-old and reading Kurt Vonnegut’s “Cat’s Cradle.” When I finished that book I realized that I wanted to be a writer, a novelist. Vonnegut lead to all kinds of other writers, some hits and some misses. In the early-eighties, Deane’s Books was my shrine. Located a block from the Atlantic Ocean, Deane’s doubled as a photo lab and bookstore; since the store closed so early, in early afternoons I would make the mile long walk after school. They rarely had the lights on in the place, instead opting for the natural lighting provided by the plate glass windows. This darkness of the room was a comfort to me and I thought that it was almost revolutionary that this bookstore seemed more like a living room than the clinical atmosphere of the chain bookstores with their operating-room, fluorescent lighting. In one corner of the store was a shelf that contained everything from D.H. Lawrence and Henry Miller to Gertrude Stein, Anaïs Nin, and The Tibetan Book of the Dead. Judging by the fading covers and tightened spines, some of these books had sat there for decades. I was introduced to such left-of-center publishing houses like New Directions, City Lights, Grove Press and anthologies like The Evergreen Review. Since these paperbacks were all “new” old stock, I bought books by the armload, as most were priced at a dollar, maybe four dollars at the most. The owner of the shop, photographer Virgil Deane, seemed amused at the stacks of books I would place on the counter. I can remember him even suggesting certain authors. It was also in this musty place where I purchased Richard Brautigan’s “A Confederate General from Big Sur.” This novel radicalized my mind. I quickly went back to Deane’s and snatched up “Trout Fishing in America” and “The Pill versus the Springhill Mine Disaster.” I idolized Brautigan and identified as much with his kind of softness he had found in alienation as I did the quirkiness of his characters and free-for-all narrative. The intimacy of his very being seemed somehow contained in the ink that dotted the old, browning pages of those books; I felt included in the story. In the same year I discovered Brautigan, he took his own life. I remember reading about this in USA Today, People Magazine or some other big media outlet and can recall how he had been essentially relegated to some countercultural relic, a “sixties writer.” I was certainly aware of suicide. In the previous year, two local kids had killed themselves; one by gunshot wound and the other drank a bottle of antifreeze. But I didn’t really know them. Brautigan’s death seemed weirdly personal. I felt like I had lost a close friend that I had never even met. Brautigan led to other poets and writers so I just followed the breadcrumb trail. I emulated my new heroes and began filling notebooks with the kind of almost-specialized, terrible-yet-sincere poetry that is surely exclusive to teenagers. I bought an old manual typewriter from a thrift store and began meticulously tapping out countless novels that would either be fully completed or fizzle out after the first two paragraphs. 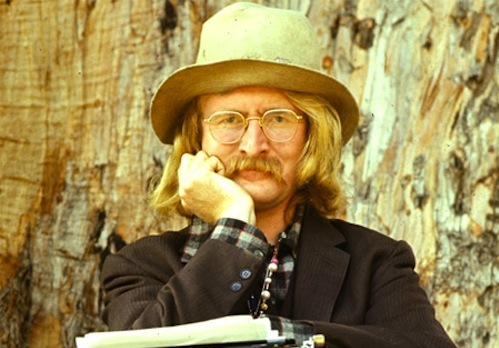 My original corrupting and enlightening influence: poet-novelist Richard Brautigan (1935-1984). At age 13, I became fascinated with “The White Album” by The Beatles. Always a fan of music, I had already begun collecting vinyl albums, a fixation that would eventually lap over into adulthood and own me for the following fifteen years; nearly three decades and 3,000-plus albums later, I would cite this as unbridled compulsion. But the two LPs that made up the 1968 album by the Fab Four had captured me fully. I felt that same crackle from five years earlier, when I was convinced that I was conjuring all kinds of barometric weirdness. Only now “The White Album” was the wizard and it seemed to control my every move. Since the opaque, white cover held few clues I was left with investigating the song titles and accompanying poster and portraits of the band for information. My fascination suddenly shifted to obsession. I played each side of the record over and over again. I would stand over the turntable watching the purple label with the gray words “Capitol” spinning around at 33 and 1/3 rpm, apparently hoping that the circular motion would force some kind of confession or revelation that wasn’t being released by the music. My fascination soon led to me staying up for two to three days on end without sleep, my body fueled by the same magical electricity that I foolishly believed that I could harness a few years earlier. I began making up reasons to miss school, my grades immediately plummeted and my energy soon turned on me. My anxiety led to all kinds of stomach aches and nausea. I would ramp up and then collapse within from sadness. 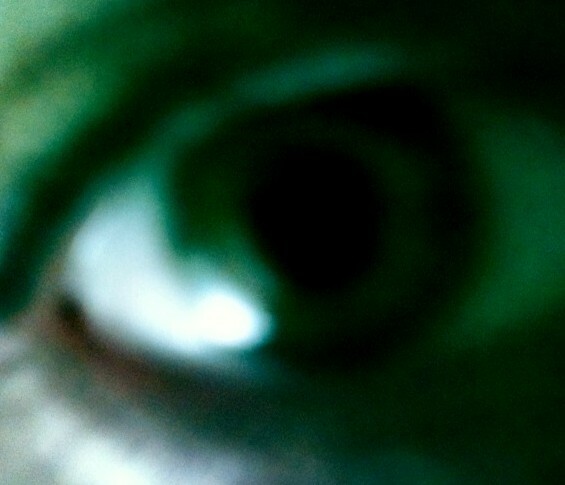 Then suddenly I would return to agitation and then try to sleep but thoughts seemed to fight for occupancy in my mind. The exhaustion from insomnia and subsequent depression made me feel as if I was walking between two worlds. At night, I started to sneak out of the house and set out on these needless midnight wanderings around my neighborhood that culminated in me walking on the beach. At some point I discovered that smoking pot seemed to lessen, or at least redirect, the ideas that seemed to move in my head at the speed of light. I smoked it alone, usually at night in the backyard in an attempt to sedate my mind. Standing hidden under a fig tree, I would blow smoke up towards the moon and wait for the drug to nullify the barrage of ideas, notions, and confusion that swirled inside of me. I don’t know how I wound up seeing the first of many psychologists. I don’t know if it was me asking my parents if this was a possibility or them suggesting it out of concern. But I knew something was not right. We all did. I clearly remember sitting in the waiting room for my first appointment. There was a middle-aged man sitting a few seats away who kept sighing in these deep, anxious breaths. I didn’t feel like I was judging him, even though my teenage mind surely wanted to. I needed to assure myself that I didn’t belong there and his obvious anguish seemed like my free pass back into normalcy. The first thing I noticed about the psychologist was that he resembled the dad from “Family Ties,” a television show that annoyed me to no end. I felt comforted by my dad being there since he could do most of the talking. Weekly visits became a part of my routine and I eventually went in alone to talk to the doctor. He suggested that part of my problem could be my intelligence. A test was arranged to see if my “genius” was part of the issue that plagued me. On the day of the big quiz, and committed to proving him wrong, I smoked a defiantly huge joint an hour before we returned to his office and was bombed as I filled out my answers. Needless to say, I succeeded in completely failing the test. The psychologist seemed embarrassed when we came back the next week to hear the results. “Well, we can rule that out.” I never received my Mensa membership card. What I did receive was a battery of examinations. CT scans, EKG tests, X-rays, and blood tests were issued to rule out the possibility of brain cancer or any organic, non-mental issues. One blood protein test apparently flagged me as possibly bearing the mark of depression. Both of my parents underwent the same testing and my mom’s DNA was labeled the guilty party. The initial diagnoses ran the gamut from depression to being in the stages of early schizophrenia yet I was finally labeled as having Bipolar Disorder. Along with these tests, I was also supplied with my first of many prescriptions. I was put on daily doses of Tofranil and Valium. My anxiety increased to the point that I had developed a mild ulcer. Every morning, two pills were placed on the woodblock in the kitchen; at night another two pills were set out for me. In the next four years I would be prescribed Tofranil, Valium, Stelazine, Nardil, Tegretol, Elavil, and then, ultimately, Lithium. One psychiatrist explained to my dad that they had made “great strides” in Electroconvulsive therapy (ECT), or shock therapy. My dad looked at me and then at the doctor, and then back at me. We left. I soon surrounded myself with a group of older friends that some would have simply labeled juvenile delinquents. I grew my hair long and adopted their standard look of blue jeans and ratty tee shirts. A few of them had tattooed their middle fingers with a peace sign. I demanded the same, a mark of identification. My parents were thrilled when I came home with my freshly stabbed India-ink-and-sewing-needle rendered body art. But in this nest of a half dozen troubled kids I found, if not understanding, a complete acceptance of my burgeoning madness. Many were from broken, if not destroyed, families and had been neglected, shunned, and some had been abused – and were being abused – emotionally, physically and sexually. I was initially shocked as I would enter their homes and meet one of their drunken parents, eager to share their weed with me, sometimes passing the burning joint over the head of a toddler. It was also at this point that it was decided that I should be removed from school. I was in the eighth grade at the time. I was briefly entered into a program where a teacher would come to the house a few times a week and teach me for an hour. Since my parents and older brother were all at work each day, I was expected to honor this commitment to continuing my education. The woman that was assigned to me was nice enough but the combination of psych meds, my now-regular daily dose of weed, and an overall hostile laziness turned my lessons into a kind of staring contest as she tried to explain algebra or the basics of the United States legislative system to me. After a few weeks I just stopped answering the door. She would knock and I would sit on the living room couch until she gave up and left. Somehow it was decided that I passed the ninth grade. That was the end of my formal education in the public school system. I was left alone each day. I returned to my original comfort in life: reading. I would pull a volume from our 1978 edition of the World Book Encyclopedia and just absorb what I imagined I was missing in school. I also read as much fiction as possible, spending every penny I had on books. The bad poetry continued. I gave up on writing novels when the $10 typewriter broke. I was eventually admitted to a teenage mental hospital. I couldn’t leave the facility, or main hallway for that matter, for 72 hours. The very idea that I was locked up sent me into an incredibly frantic state. The best thing happening there was that I could smoke cigarettes, a habit I had picked up in the previous year. I guess my parents kind of accepted my smoking since I was increasingly fucked up like a soup sandwich in every other regard. There was a tiled room filled with overflowing ash trays and an electronic lighter on the wall (patients were prohibited to own actual cigarette lighters). You pushed a metal button and a round, one-inch diameter of steel would quickly turn orange like a burner on an electric stovetop and you would lean in, cigarette in mouth, and light up. While I was there, another patient decided to press her face against the wall lighter. She was led off to a seclusion room, sobbing with a planet-shaped burn on her cheek. She was confined, placed under observation, and everyone’s smoking privileges were pulled for twenty-four hours. The following day, the other patients were grousing over the unfairness of this punishment as we picked at our breakfast in the day room. I suddenly plotted my escape. It seemed quite simple. My dad had loaned me his old powder-blue Sears suitcase when I packed for my admission into the hospital. I had not slept since I arrived there and had been looking for ways to get out. I didn’t know what my plan was once I escaped but I imagined I would figure that out once I scaled the east wall. The cleaning crew came in mid-morning during the same time that one of the group sessions was held. I declined to go to group and sat on the edge of the bed in the room that I shared with three other teenage lunatics. As I heard the vacuum approaching our room, I quietly closed the door, a forbidden act in the ward. When the vacuum was outside of the door I began to furiously swing the packed suitcase at the plate glass window. I was hoping that if I could crack the center of the pane I would then be able to kick the rest of the glass out and climb away to an uncertain freedom. I swung it over my head, sideways like a baseball bat, and then started kicking at the glass. It was hopeless. After the twentieth blow, I finally realized it was plexiglass. I was eventually released from the ward and it seemed like life went on as usual. I had a new saga to tell my friends but they seemed unimpressed. Most of them had already spent time in juvenile delinquent halls or even jail, so my tale of incarceration probably sounded like a visit to a spa to them. The whole experience doubled my cynicism towards my predicament. In the eighties, growing pains had transmuted into “chemical imbalances,” a catch-all diagnosis apparently directed towards any kid with a bad attitude or weird outlook. This is was what I told myself repeatedly to disqualify myself from the pack. 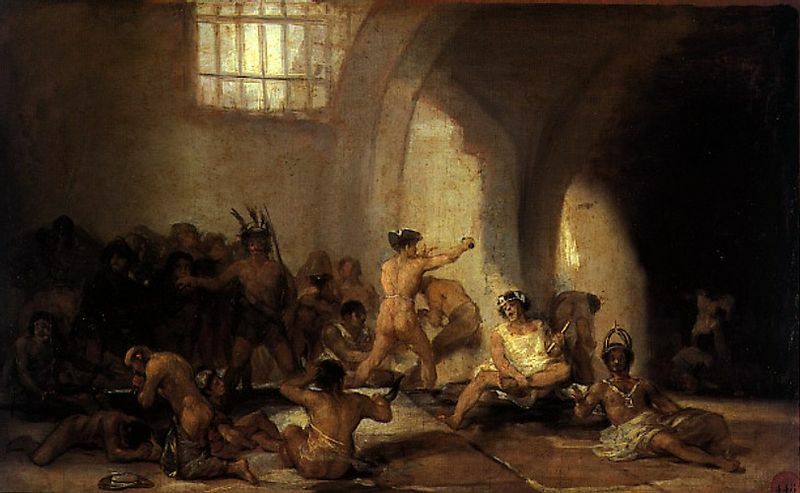 Franciso de Goya’s “The Madhouse,” (1812-1819); thankfully, during my brief time spent in the the teenage bughouse, I could still smoke cigarettes. The vomiting increased and I couldn’t keep any food down. My dad took me to have a CT scan for my stomach and esophagus. I would be awake for the procedure. Two bottles of barium were produced. “It tastes like strawberries. You need to drink both of these so we can see what’s going on with you,” said the technician. I tried. I would get down a mouthful of the chalky, pink liquid and then immediately puke it back up. And we would try again. I leaned over and puked all over my hair and the white paper that covered the examination table. Buckets and small plastic containers were produced to catch the vomit. “Just keep trying. You need to drink these or we can’t see what is happening inside of you.” Eventually they gave up but by that time the room was covered in ropes of pink vomit. My dad held my arm as we walked back to our ’83 Chevy Cavalier. I would double over, regurgitate more barium, and then he would pull me upright. When we left, the path where we had walked through the parking lot looked like a line of cotton candy that had melted in the sun. That same year I made my first attempt at suicide. Agitated to some internal edge that I never even knew existed, I swallowed all of the pills of my recently refilled bottle of Tofranil. I walked down to the beach to see a friend. I guess I went to say goodbye. I’m not really sure. We spoke for a brief moment. My memory fails me in whether or not I admitted that I was in the process of murdering myself. Tofranil is classified as an anti-psychotic. Over the course of the three-mile walk back to my house, the chemical payload began to detonate in my bloodstream and brain. I began to hallucinate. Aztec-like figures, odd astrological wheels, trailing lights, and cascading, hieroglyphs transmitted from some alien language would spiral and pinwheel across my field of vision. The drug seemed to numb any sense of horror or fearful response. Yet I didn’t feel comforted. I was just experiencing consequence. “I am dying,” I told myself. Some kind of self-survival urged me to wake up my parents. I kind of paced up and down the hallway, wondering how to admit this to them. I was embarrassed by my foolishness. I shook my Dad awake. “I’m trying to kill myself. I took all of my pills.” The lights of the Emergency Room lobby were the closest I came to seeing any kind of Heavenly white glow that night. I was quickly ushered into a small examination room by two nurses. They moved quickly and quietly. I looked up at the ceiling tiles as they laid me down on a gurney. The tiles seemed to pulsate in a rhythm of black, gray, and white. Words would appear on the particle foam surface but then vanish before I could read them. Distracted by all of this, I didn’t notice as one of the nurses returned with a long piece of clear, plastic tubing that was slathered in a clear gel. She guided the tube down my throat. As they began pumping my stomach, one of the nurses switched off the overhead lights. While I was touched by her consideration in mood lighting, I thought this was darkly comical, as if to say, “Please disregard the three foot tube running down your throat.” The door was slightly open and various medical staff and patients walked down the hallway of the ER, their shadows moving across the wall in front of me as the machine began to make a low whirring sound. Brown Tofranil gel capsules were being slowly sucked out of me. I watched as each pill climbed up through the clear tubing. I started to count them but eventually lost interest. I do remember thinking, “This is a moment I will not forget. This probably changes things.” And I was correct. I spent the next few days in a room in the ICU. The first night I was restrained to the bed’s metal railing with blue, Velcro straps. My parents visited and brought my cassette player and headphones and I listened to Bob Dylan’s “Blonde on Blonde” continuously for the next three days. I would fade in and out of consciousness, waking up to the sound of Dylan rasping away. I also remember asking a younger, redheaded nurse out on a date, an offer that I’m sure got a good laugh at some nursing station or break room. At one point I woke up and my arm had swollen up to twice its size. Someone had missed my vein with an IV and the fluid had turned my right forearm into a Popeye-like appendage. I later told my friends that before I took the pills, I listened to David Bowie’s “Rock and Roll Suicide,” a lie that in hindsight was probably based on a distancing from the act, while possibly even justifying that very same decision in some sad attempt at adolescent, self-mythologizing. The years of my middle adolescence were spent dosed on lithium and equally treated by my own regimen of pot and LSD. While I loved acid from that very first sight of the proverbial “breathing walls,” I also had a few full-blown, psychotic breaks from reality after ingesting the drug. A friend and I still joke about the time that I stayed over at his house to trip. He woke up just as I was leaping from the foot of his bed, completely delusional from the drug strobe-lighting my synapses, and hurled my body at full force into his bookcase. We still refer to this as my “Famous Attack on Literature.” I remember none of this actually happening but the story seems appropriate and typical of my then-mindset. It was during this time that I also joined my older brother’s hard rock and metal band as the bass player. I played my first gig at age 14 at a beach bar, completely terrified and staring at the floor as we tore through a few original numbers and our renditions of ZZ Top’s “Beer Drinkers and Hell Raisers” and Deep Purple’s “Child in Time.” The band was led by two twentysomething guitarists and I remember how I had to wait outside before we played, was whisked in during our performance, and just as quickly sent back outside when we were done. My parents’ worries were now compounded as I would be gone at all hours of the day. My dad assured me, “If you break the law, you had better hope the police get to you before I do.” That promise stuck in my head, and I would invariably bow out of any plans for breaking and entering, or worse. As soon as the blue police lights flashed in the distance, I was the first one over the fence, gone. Like many teenage bonds, these were soon broken and I somehow orbited into another group that shared my love not only for getting high but also, amazingly, reading and even visual art. Now in my mid-to-late teens, I traded in my Black Sabbath records for Black Flag and traveled in the stream of underground rock. An all-ages alternative rock club changed my life. I eventually somehow landed a job there, and carrying the equipment from horrifyingly smelly vans to the stage for various touring bands put the idea in my brain to one day do the very same thing. “Yet man is born unto trouble, as the sparks fly upwards” – (Book of Job 5:7); Lunatic Larva, age six. This entry was posted in memoir and tagged addiction, bipolar disorder, memoir, mental illness, recovery on October 21, 2013 by starehouse. still reading..will read some more tomorrow as well. Good stuff !